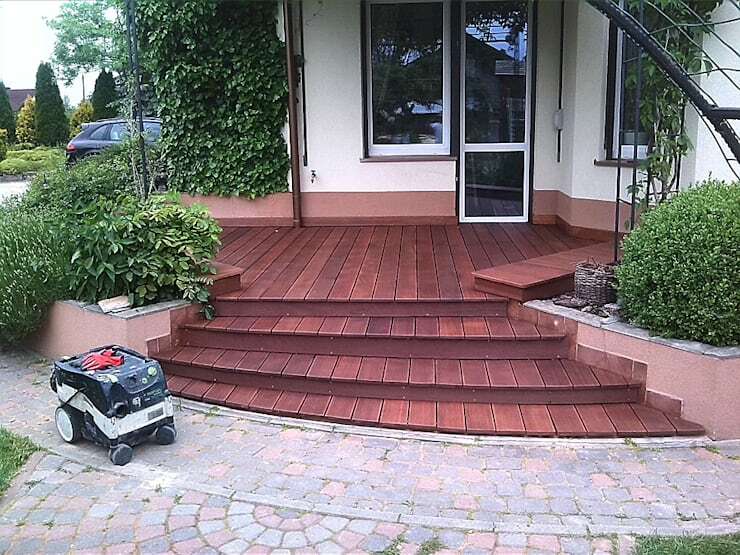 The decision was made to build and install a wooden platform to define the entrance to the house. 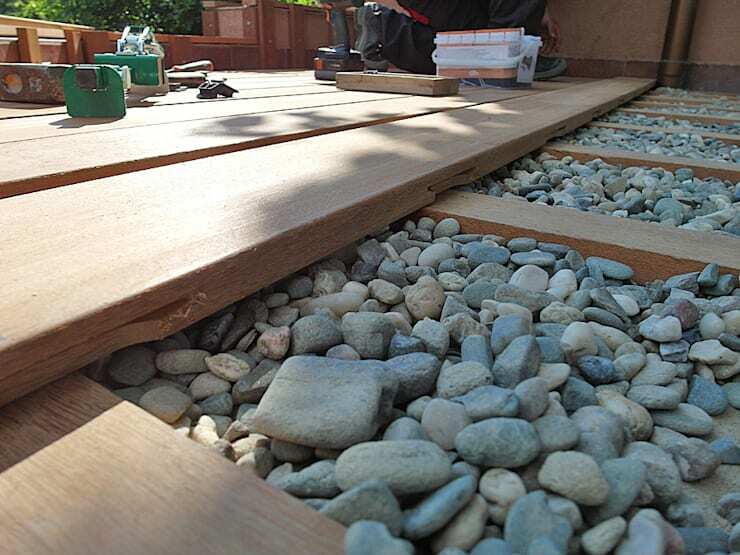 First the area where it was to be installed was prepared, with a bed of gravel and a simple wooden framework on which to build the structure. This maxim is much used by professionals in the construction industry, as taking measurements twice ensures materials only need to be cut once! Here we see the experts in the process of measuring large sections of wood, which are cut and then fixed to the foundation structure placed at the sloping entrance. 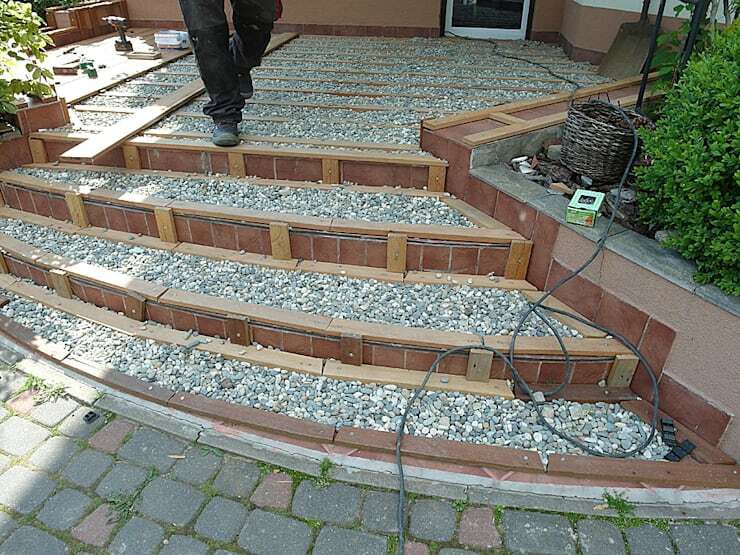 Once measured and cut, each plank is fixed to the base, gradually forming the entrance platform to the house. This is done by means of nails, adhesives and special resins, which ensure fixation between the component parts. 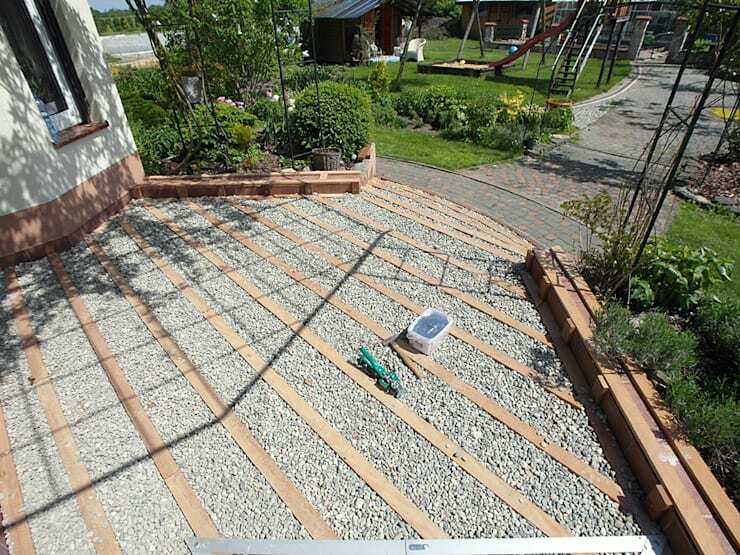 The gravel serves two functions in the formation of a wooden platform: first, it provides a base that helps level the already finished platform, and second, it's an excellent way to drain water and preserve the structural integrity of the platform. 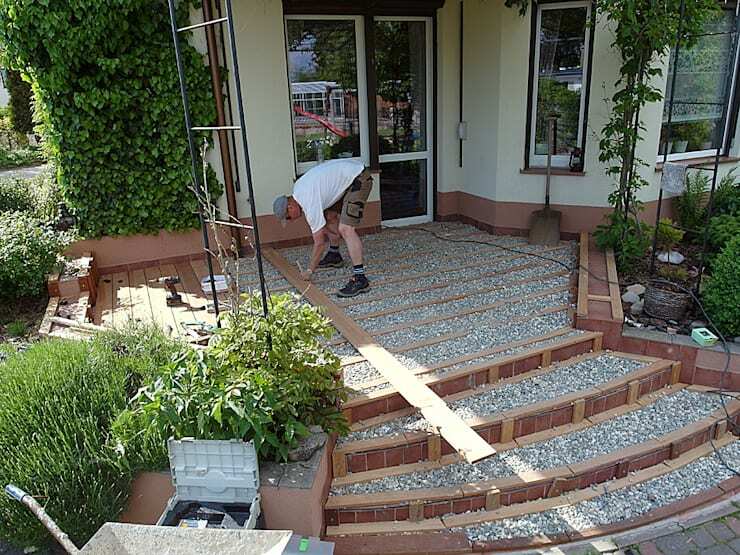 Once all the pieces that form this new entrance area have been placed, the finishing touches are added to the platform and steps. Each piece of wood is sanded, polished and varnished to ensure they look incredible and to help the wood become more resistant to the elements, thus lasting much longer. In addition to the slats that make up the platform, wooden blocks have been constructed to serve as seats, creating a social space accessible for the whole family. 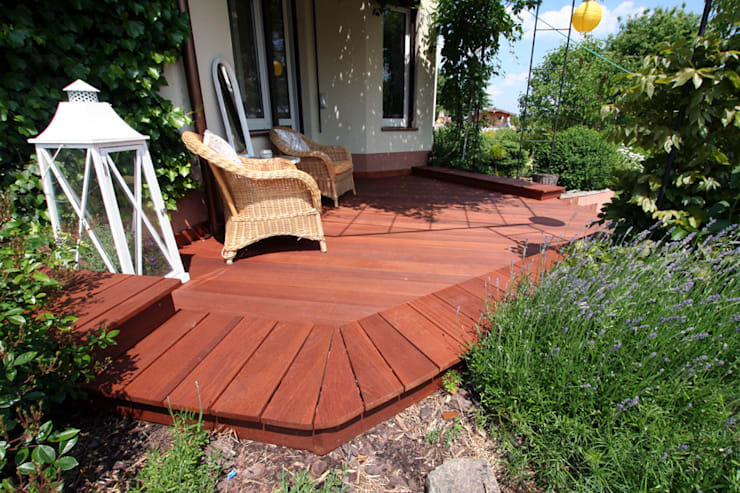 These allow everyone to participate in a pleasant conversation while enjoying the outdoors. 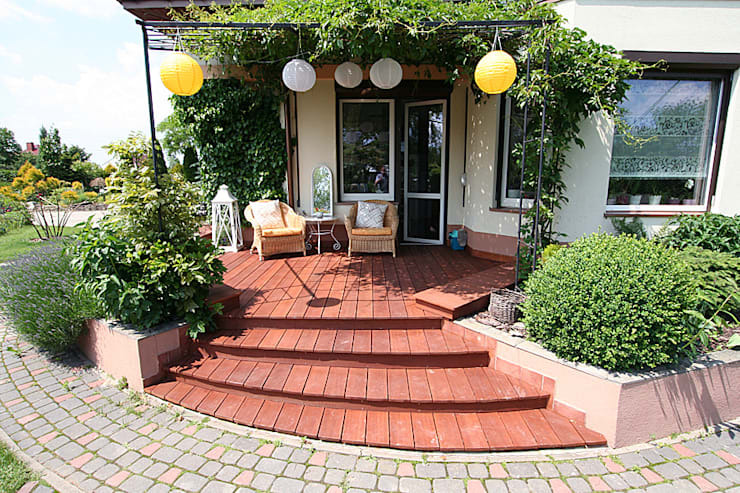 The beautiful decking and porch give the perfect welcome to this cosy house! The addition of a lightweight metallic trellis allows us to add creepers, which join the existing vegetation in a glorious explosion of green. This same structure is used to hang some special spherical lanterns for exteriors, giving a touch of colour and fun to the space. We take a few steps back to admire the overall view of the finished project. The tone of wood used on the platform perfectly matches the tiles covering the sloping roofs of the house. The overhanging vines help to create some pleasant leady shade, mitigating the high temperatures caused by direct sunlight. 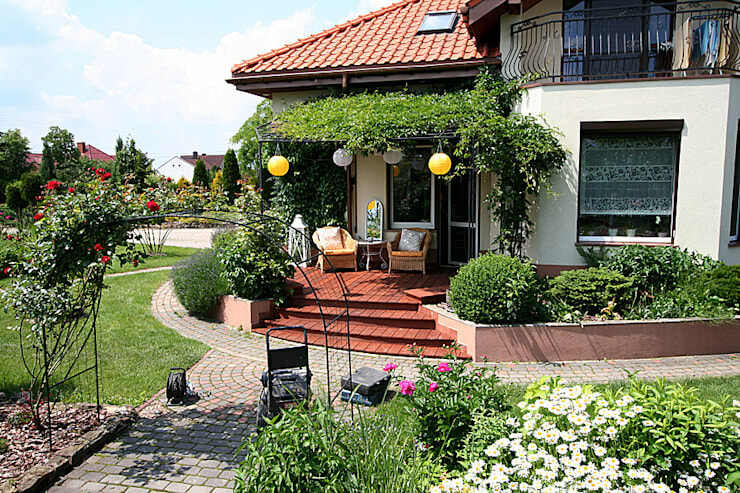 All in all, a simple project that has added magnificent value to this beautiful house! For home entrance ideas, check out 9 stone cladding ideas to make your home entrance special. Is the entrance to your house as inviting as this?